Incarnateis a 2016 American supernatural horror film directed by Brad Peyton and written by Ronnie Christensen. It stars Aaron Eckhart , Carice van Houten , Catalina Sandino Moreno , David Mazouz , Keir O'Donnell , Matt Nable , and John Pirruccello. The film was released on December 2, 2016, by BH Tilt , High Top Releasing , and Universal Pictures . In a night club Dr. Seth Ember approaches a middle aged man named Henry and asks him what time it is. Dr. Ember reveals that time has not and will not advance, and then gives Henry a gift given to him by his partner at a law firm. Henry suddenly realizes that he is actually dreaming, and Ember reveals that the woman Henry has been with is a demon who has possessed his body. Dr. Ember and Henry are immediately attacked by two bouncers, but manage to escape and with Henry's help return to reality and free him from the demon possessing him. In the waking world it is revealed that Dr. Ember is actually wheelchair bound and now has a burn mark on his wrist from where the demon grabbed him in the dream world. Dr. Ember's assistant Oliver warns that the demons have started to adapt to Dr. Ember's efforts and that soon he may not be able to escape back to reality. Dr. Ember is approached by Camilla, a representative from the Vatican, who asks Dr. Ember to exorcise a boy named Cameron Sparrow. Ember refuses stating that his methods are not "exorcisms" and is uninterested, but Camilla reveals that the she believes the demon is one Dr. Ember knows named Maggie. Ember scoffs at her and asks her to leave, but later he visits a priest named Felix to question whether the demon could indeed be Maggie which Felix affirms. Felix offers Ember a vial of blood from a possessed man which, when injected, would allow Ember about 10 seconds of lucidity - just enough time to commit suicide, but Ember refuses to take it. Dr. Ember travels to the boy's apartment with Camilla and meets Cameron's mother, Lindsay. The boy's mother initially refuses to submit to an exorcism, but Dr. Ember explains that he does not exorcise demons but evicts them by entering their host's subconscious to make them realize they are dreaming. Ember further explains that demons do not have the power to truly control those they possess and instead lull them into comforting dreams so they will be unaware while the demon uses their body. Dr. Ember then visits the possessed Cameron and confirms that he is possessed by Maggie and that the demon recognizes him. Later that night Dr. Ember reflects on his own dead wife and child, and puts on his son's crucifix. Dr. Ember, Oliver, and, the third member of their team, Riley prepare for the eviction. Riley explains to Lindsay that their equipment will monitor the brain frequencies of both Cameron and Dr. Ember, and that by entering a near death state Dr. Ember will be able to synchronize his brain frequencies to Cameron's and enter his subconscious. However in this state Dr. Ember has only about eight minutes before his heart will give out. Riley further explains that time in a possessed person's subconscious is stuck at the moment they were possessed. Dr. Ember enters Cameron's dream and sees him with his father, Dan, in a park, but suddenly begins bleeding and has a seizure and has to be pulled out of the dream to be revived. After witnessing Cameron with his father in the dream Dr. Ember demands that Dan be present to help evict the demon. Lindsay refuses, explaining that the couple separated after Dan broke Cameron's arm in a drunken rage, but she agrees to tell them where to find Dan when Ember insists that Cameron's father may be the only way to save Cameron. Dan's presence initially seems to help, but Maggie reasserts itself inside Cameron and lashes out at his father. In the struggle Ember pleads with Maggie to release Dan as he, Ember, is who Maggie truly wants. Maggie agrees to release Dan but he dies as a result of his injuries. Lindsay, alarmed, demands to know Dr. Ember's history with the demon and his true motives regarding Cameron. Dr. Ember reveals he discovered at the age of 26 that he had the power to perform Astral Projection and enter the dreams of other people, but hid his power to live a normal life. Unwittingly, however, this power made him a target for demons. One day, while driving with his wife and child the three are hit head on by another car driven by a possessed driver. The attack left Ember's family dead and confined him to a wheelchair, and ever since he's been hunting the demon "Maggie" who he named after the woman it had possessed. Preparing for the worst Dr. Ember travels to Felix to acquire the blood vial, but discovers Felix's loft in disarray. Ember receives a vial of blood, but discovers that Felix has been possessed. Felix attacks Dr. Ember but suddenly slits his own throat. As he dies Felix taunts Ember, telling him that Maggie wants to consume him and tells Ember he should pray for a quick death. Returning to Cameron's dream, Ember finds him with his father. Ember begins trying to reason with Cameron, and using a ring that Cameron had received as a gift from his real father, makes him realize he is in an illusion. Ember and Cameron flee from Maggie in the form of Dan, and Ember helps Cameron escape before struggling with Maggie and seemingly defeating it using his son's crucifix. Ember and Cameron wake up, but Ember suddenly wakes up again in a hospital with his wife and son who explain he's been in a coma for the three days since the accident. Ember realizes he's now inside his own dream and flees, running into Maggie. Ember begs Maggie to release Cameron and take him instead, to which the demon agrees. However when Cameron wakes up Riley administers the blood and Ember uses his ten seconds to fling himself from the apartment balcony. As he dies Riley warns everybody not to touch Ember's body. In an ambulance paramedics, joined by Camilla attempt to resuscitate Dr. Ember. They succeed to get a heart beat, allowing Maggie to possess Camilla, before Dr. Ember dies. 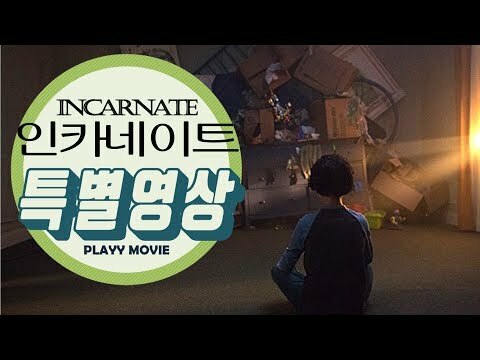 // [감자의 3류 비평] 인카네이트 (Incarnate, 2016) 예고편 5960 views runtime : 0:00:00 감자의 3류 비평 (http://gamja-blog.tistory.com/)..